It's not that I'm terribly superstitious or anything. I admit to picking up pennies off the sidewalk when I come across them. If I see a pair of shoes with the left shoe on the right and the right shoe on the left, I feel compelled to put things right (though only with shoes I'm related to). So the other day when I ran across some black-eyed peas in the bulk bins at the store, it seemed like a no-brainer to cook up a batch for the first day of 2012. That's because, in the seemingly infinite collection of useless knowledge I carry around in my head, I know that it's a traditional dish served on New Year's Day down South. And it's said to bring prosperity in the coming year, so why not? Plus it's super easy to cook up in a couple of hours, especially if you let the beans soak overnight the night before. Place dried beans in large pot. Add water to cover by 3-4". Cover with lid and let sit out overnight. The next day, at least a couple of hours or more before serving, drain any liquid from the beans and rinse. Heat olive oil over medium heat in large soup pot until it shimmers. Add onion and garlic and sauté till tender. Add celery and sauté till tender. Add oregano and bay leaf and heat briefly. Add chicken stock, drained beans and ham hock, adding water if necessary to cover. 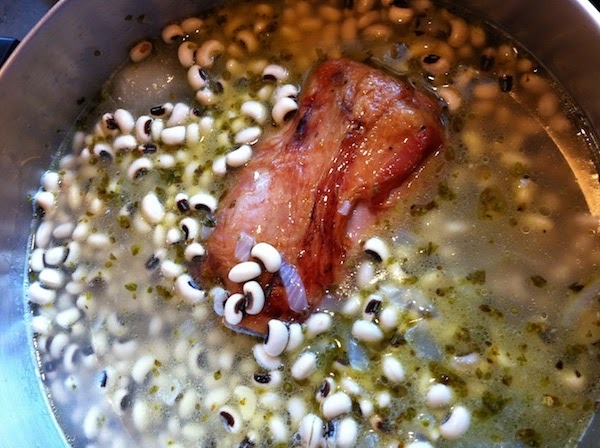 Bring to a boil, then reduce heat to simmer and cook until beans are tender, at least 90 minutes to 2 hrs. (Again, don't let the beans get too dry; add water as necessary.) Add salt and pepper to taste. 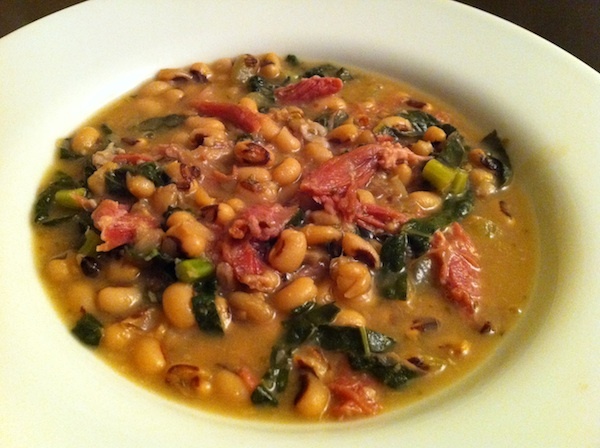 Before serving, remove ham hock and shred meat from bone, adding meat back to the beans. Add kale and simmer briefly till it wilts and turns a dark green. Serve with cooked white rice. You can also supplement with finely chopped green onions and hot pepper sauce. * At least according to Wikipedia.